Golf Tours around Scotland have been the speciality of McLaren Travel since it was established in 1997. 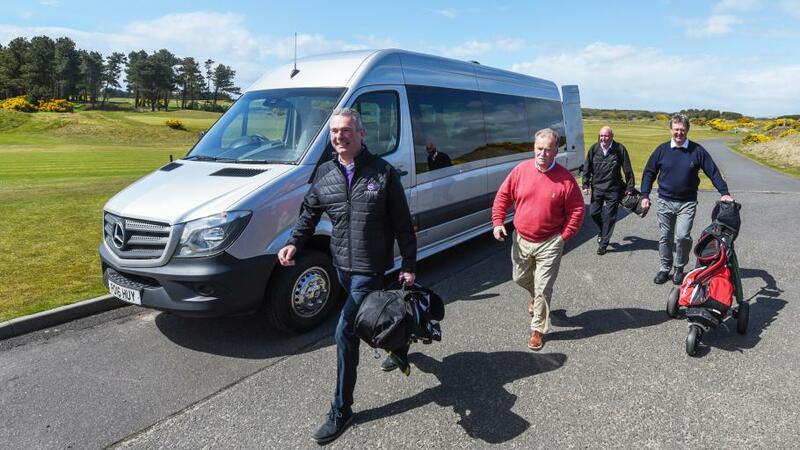 McLaren Travel have provided travel services for many, if not most, of Scotland's incoming golf tour operators and provided independent travellers quality chauffeur and private coach services for their small groups. With coaches serving the needs of up to eight golfers there is no travel company in Scotland with any more experience or knowledge of Scotland's golfing product than McLaren Travel. From Turnberry in the south west to the Trump International in the north east; St Andrews, Muirfield and Carnoustie on the east coast; Troon, Prestwick or Western Gailes on the west; Dornoch, Nairn or Castle Stuart in the Highlands, they all recognise the team at McLaren Travel and you can be assured that this knowledge and experience will benefit any golf traveller to Scotland. We are ideally placed to make the short hop across the Irish Sea to those well-known Emerald Isle hotspots. Many of our concierges are very well acquainted with those in the North such as Royal Portrush and Royal County Down, down to The K Club and Portmarnock in Dublin and further South to Trump Doonbeg, Ballybunion, Lahinch, Waterville and Old Head et al. Our experience in trips to Wales to Royal Porthcrawl and Royal St.Davids, the North-West of England around Royal Birkdale and Royal Liverpool or further South around London establishes our place and knowledge around all of the British Isles.